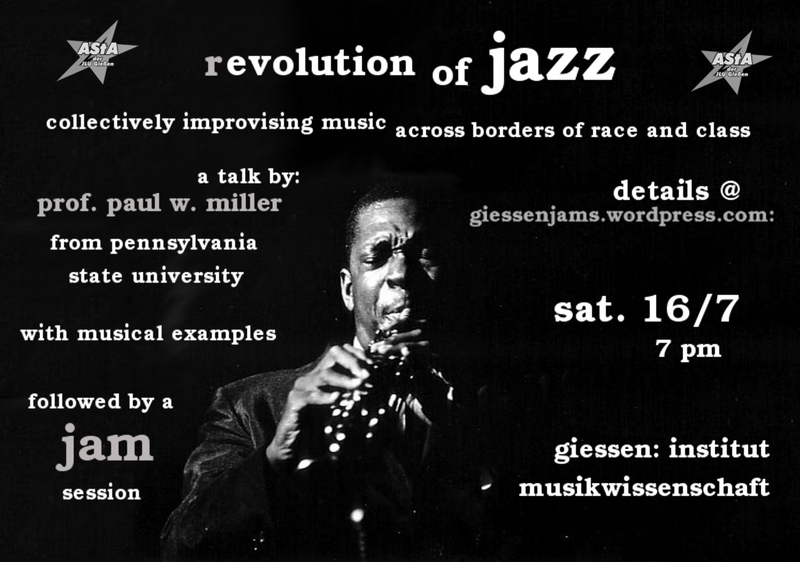 A talk by Prof. Paul W. Miller from Pennsylvania State University including musical examples, followed by a jam session. Saturday 7 p.m. 16th. of July @ giessen institut musikwissenschaften. Exploring the origins of jazz and its role in the civil rights movement. A possibility for jazz lovers and jazz performers to meet.. Bring your saxophone. Dieser Eintrag wurde veröffentlicht am Montag, 20. Juni 2011 um 11:35 am	und veröffentlicht in Uncategorized. Du kannst den Antworten zu diesem Eintrag per RSS 2.0-Feed folgen. « Why are we doing this?